Ludwig Lange Father of the Inertial System: How Albert Einstein and His Greedy Friends Plagiarized Ludwig Lange's Work, Ruined Ludwig Lange's Life and Spat on His Grave is the true story of how Albert Einstein and his friends manipulated credit for Ludwig Lange's theory of the inertial system and literally drove him mad culminating in his death in an insane asylum. Lange and Einstein not only clashed over the issue of plagiarism, but on a number of political issues as well. Einstein hated Germans and wanted to see the nation of Germany divided and ruined. Lange was a patriotic German who publicly opposed moral and political relativism and sought to protect Germans from internationalism and communism. Numerous noteworthy scientists sought to give Lange his due credit for his innovations, which were fundamental to the special theory of relativity. Albert Einstein and Max von Laue colluded with the press to smear these men with racist accusations as a means of distracting the public from their honest charges that Einstein was a career plagiarist and a self-promoting fraud. In 1885, the young mathematician and physicist Gustav Ludwig Lange published a remarkable new theory, which presented a novel method for mapping uniform, rectilinear motion of translation. He called these reference systems "inertial systems". Lange firmly believed in his theory and patiently waited until his death for the scientific community to recognize his unique contributions to science. Instead of acknowledging Lange's priority for this fundamental element of the special theory of relativity, and despite Lange's public plea for recognition, Albert Einstein and his friends ridiculed Ludwig Lange and took credit for his revolutionary ideas and nomenclature. Ludwig Lange died in a mental hospital suffering from severe depression brought on by Einstein's plagiarism of his work. All of Ludwig Lange's papers on the inertial system are republished, as is his scarce article "Mein Verhältnis zu Einstein's Weltbild" (My Relationship to Einstein's Conception of the Universe) in which Lange details the facts exposing how he and Ernst Mach were being deliberately written out of the history of relativity theory. 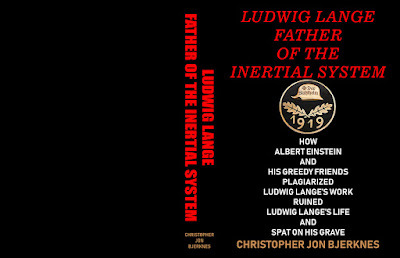 The book provides a complete history, including extremely rare booklets and newspaper and journal articles from the period, of Albert Einstein, Max von Laue and Einstein friends' dishonest, racist and hypocritical smear campaigns against Ludwig Lange, Ernst Gehrcke, Philipp Lenard and Paul Weyland. Did the Jews Just Teach Mark Zuckerberg a $16 Billion Dollar Lesson? On Wednesday, 18 July 2018, Kara Swisher of Recode interviewed Mark Zuckerberg. He informed her that he did not believe Holocaust revisionists should be censored on facebook. A firestorm of criticism erupted from the Jews and Zuckerberg was a lonely voice defending the right of free speech. Today, Thursday, 26 July 2018, the press gleefully reported that Zuckerberg lost 16 billions dollars as facebook stock dropped some 20%. Is this merely a coincidence, or did the Jews just send Zuckerberg a $16,000,000,000.00 message? Zuckerberg is member of the tribe. Jews are not supposed to inform on the tribe, or side with Gentiles against the Jews. The punishment set forth in Jewish law for disloyalty is death. A Jew who reveals secrets of the Jews is referred to as a "Moser" and the law of din Moser imposes a death sentence on those Jews who betray their fellow Jews to the judgement of Gentiles. "Two additional halachic laws are of special importance both generally and specifically when related to the Rabin assassination. These two laws, employed since talmudic times to kill Jews, were invoked by the assassin, Yigal Amir, as his justification for killing Prime Minister Rabin and are still emphasized by Jews who approved or have barely condemned that assassination. These are the 'law of the pursuer' (din rodef) and the 'law of the informer' (din moser). The first law commands every Jew to kill or to wound severely any Jew who is perceived as intending to kill another Jew. According to halachic commentaries, it is not necessary to see such a person pursuing a Jewish victim. It is enough if rabbinic authorities, or even competent scholars, announce that the law of the pursuer applies to such a person. The second law commands every Jew to kill or wound severely any Jew who, without a decision of a competent rabbinical authority, has informed non-Jews, especially non-Jewish authorities, about Jewish affairs or who has given them information about Jewish property or who has delivered Jewish persons or property to their rule or authority. Competent religious authorities are empowered to do, and at times have done, those things forbidden to other Jews in the second law. During the long period of incitement preceding the Rabin assassination, many Haredi and messianic writers applied these laws to Rabin and other Israeli leaders. The religious insiders based themselves on later developments in Halacha that came to include other categories of Jews who were defined as 'those to whom the law of the pursuer' applied. Every Jew had a religious duty to kill those Jews who were so included. Historically, Jews in the diaspora followed this law whenever possible, until at least the advent of the modern state. In the Tsarist Empire Jews followed this law until well into the nineteenth century."--I. Shahak and N. Mezvinsky, Jewish Fundamentalism in Israel, Pluto Press, London, (1999), pp. 137-138. Taking Zuckerberg's life would have been a bit too obvious and severely counterproductive. Taking $16 billion is severe punishment. They will watch and see if he has learned his lesson.